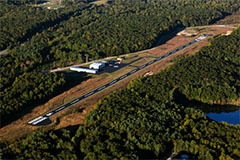 Welcome to Ace Aerobatic School located at the Sewanee-Franklin County Airport (KUOS) on the campus of the University of the South. Sewanee is located atop the Cumberland Plateau and offers a peaceful and picturesque training environment. We offer two main courses, Spins and Aerobatics with options to tailor the emphasis to individual needs. For example, aspiring flight instructors may obtain a “spin sign-off” as part of either course. Custom courses and refreshers are also available. Catherine Cavagnaro is Chief (and only) Flight Instructor. She holds Airline Transport Pilot and CFI-I certificates as well as a Ph.D. in mathematics. Her trusty 1979 Cessna Aerobat “Wilbur” provides a wonderful platform for spins and aerobatics.